Gasthof Amish Village, billed as an “oasis in the farmland” of Southern Indiana, offers a hotel, restaurant, antiques, and craft shops. It sits on a 25 acre lake in Daviess County, and provides visitors a sample of authentic Amish food, in a traditional Amish setting, built with Indiana timber. Their bakery has fresh homemade pies, noodles, cookies, cakes, and bread, which is made onsite every day. They also produce their Amish crafts and food — including apple butter and peanut spread — locally, which they sell in their shops. 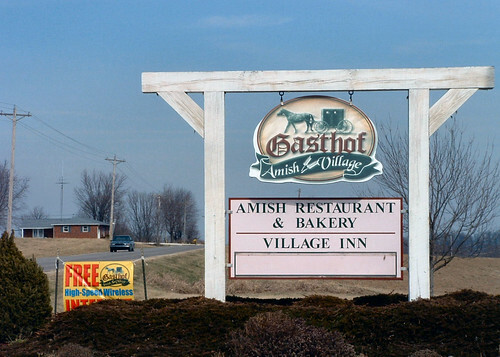 Gasthof Amish Village also has a lodging and meeting facility that has banquet and retreat space for groups, parties, reunions, and even weddings. And if you love comfort food, you need to visit their restaurant, which is a veritable cornucopia of comfort food — beef and chicken dishes, potatoes, vegetables, and rich desserts. When you’re done, visit the Gasthof Gift Shop for country decor and crafts, including jewelry, handbags, and of course, quilts.